As more hospitals and physician practices adopt EMR systems, radiologists are looking for ways to incorporate EMR data in their interpretations and reports. How those data are accessed and used, however, is still evolving, says Kevin W. McEnery, MD, director of innovation in imaging informatics and a professor of radiology at the University of Texas MD Anderson Cancer Center in Houston. Because radiological specialties vary, the ways that radiologists use EMR data also varies. For example, McEnery, who specializes in sarcoma, may look for different markers in a study, depending on the type of sarcoma with which a patient is diagnosed. Or an oncologist may look at an image differently than an orthopedist. Additionally, the ways that different health care organizations make EMR data available to radiologists varies widely. What's important, McEnery says, is that EMR data allow radiologists to see a broader picture of a patient's overall health. "I think the important thing about an EMR is that it potentially informs the radiologist more deeply than just the simple, one-line clinical history 'cancer' or 'trauma' with the reason for the exam given as 'pain,'" McEnery says. "Although that gets billed and fulfills the requirement for reimbursements, I think the radiologist who has a deeper understanding of the patient's comorbidities can potentially limit or expand their differential diagnoses, depending on those comorbidities." To find out how radiologists are using EMR data, McEnery is chairing a session on integrating EMR data into radiologists' workflows at the Society for Imaging Informatics in Medicine's 2016 Annual Meeting. The session, "How Practices Can Integrate Clinical EMRs Into Their Imaging Workflow," is designed as an opportunity for imaging informatics professionals to share what they've learned about EMR integration, ask questions, and talk about best practices. McEnery says he's curious to hear about others' experiences, particularly because MD Anderson is in the process of switching from a homegrown system to Epic's EMR. One of the most important factors in effectively using EMR data, McEnery says, is accessibility. Whether the system actively presents the relevant patient data to the radiologist can significantly affect the time it takes radiologists to review the case. Although most radiologists have some type of access to EMR data, they may have to navigate through multiple screens to get to it. Typically, radiologists have to click into the EMR to see comorbidities or disease states. As the technology advances, McEnery expects to see more tools that find pertinent information for radiologists and automatically provide EMR information with each patient record. Including EMR data in radiologists' workflow is a challenge, however. 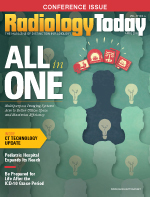 As MD Anderson has progressed with its EMR implementation, McEnery says the organization has learned that radiology workflow affects and is affected by many other workflows, such as order entry and reporting. He expects that MD Anderson will have to quickly adapt to unexpected changes after the system goes live. "One thing we're learning now is that the EMR workflow doesn't just change things in radiology; it's changing workflows up and down the continuum. Because it's not live yet, we're expecting certain things to happen, but we're also expecting some of our presumptions to change," McEnery says. "When we talk to people [who have been through an EMR implementation], one of the things we've heard over and over again is that some of the assumptions that were made before 'go live' don't pan out because the entire enterprise is learning different workflows. Some of the things that were efficient before are now inefficient, and vice versa." McEnery sees many potential benefits of incorporating EMR data into radiology workflows. For example, knowing whether a patient is a trauma patient or has a potential metastasis may influence the template or type of report that a radiologist chooses, leading to a more clinically helpful radiological interpretation. And because appropriate use criteria will be derived from EMR data beginning in 2018, McEnery also expects EMR data to influence imaging preauthorizations, order entry, and imaging protocols. He foresees many more touch points between radiology and the EMR than there have been in the past. In addition, because EMRs will drive workflow for referring physicians, radiologists can demonstrate value and improve patient care by tapping into EMR workflows, McEnery says. He notes that, much like radiologists, referring physicians are facing many of the same pressures to deliver better care faster. How well radiologists help referrers respond to those pressures will go a long way toward determining how radiologists are perceived within the health care system. "Are we making the clinician's life easier? Are we making the clinician more efficient and effective because we understand the workflow and the clinical service that they're performing?" McEnery says. "The EMR is fundamentally going to be the workflow driver for the clinician, so the extent that radiology partakes in the workflow driving of the clinician is going to be one of the areas of potential value."